Living Space Construction are popular building contractors in Poole offering a range of building services in Bournemouth, Poole and Dorset. With over 15 years of experience they are a trusted construction company near Poole. From house extensions in Poole to installing new orangeries in Bournemouth, Living Space Construction are a professional building company in Dorset taking on building jobs, both big and small. Their team of general builders in Bournemouth and Poole carry out brickwork, landscaping and full home refurbishments. Living Space Construction specialise in building house extensions in Poole and Bournemouth. From a small garage conversion in Bournemouth to large orangeries in Poole, their local builders in Poole and Bournemouth can help you maximise your space. 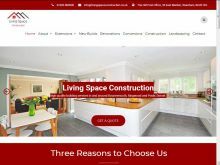 Contact Living Space Construction in Dorset today if you are looking for a builder in Poole or property renovations in Bournemouth!